The hotel was clean and the staff where polite; however, there was a considerable amount of noise from the freeway and the parking spots were very narrow. There was also a free breakfast. I would take my wife and stay there in a heartbeat. We plan on being in the area again. Terrific room; 1st class accommodations. Good for a 2 Star! Had a nice 5 day stay! Only had one minor problem for one day (Shower sometimes changed temperature randomly). Big room, friendly staff & good breakfast. If you are walking from place to place it is not in a convenient location. 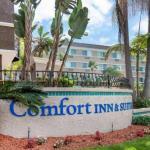 The 200-room Comfort Inn and Suites Zoo is close to both the San Diego Zoo and SeaWorld and provides affordable quality accommodation designed for the vacationer but equally suited to the business traveler. Items include with the room rate at this non-smoking hotel are a deluxe continental breakfast, high-speed Internet access, local telephone calls and in-room coffee. The property is a five-minute drive from the Riverwalk Golf Club and Westfield Million Valley Mall and the Fashion Valley Mall. Other area landmarks and attractions include Old Town San Diego State Historic Park, the Gaslamp Quarter, Balboa Park, Legoland, Torrey Pines State Beach and La Jolla Cove. All the rooms have a work desk with ergonomic chair and high-speed Internet access, 32-inch flat panel television with cable movie and news channels, refrigerator, coffeemaker, iron and ironing board, hairdryer and telephone with voicemail. The two-room suites have a private bedroom with a king or two double beds and a living room separated by French doors. Suites include all the amenities of a room plus a double sofa sleeper or bunk beds, microwave oven and two flat panel televisions. This hotel has an outdoor heated swimming pool, hot tub and a fitness room. The 24-hour front desk has information on area events and attractions. Other amenities include copy and fax machines available for guest use, daily housekeeping, a guest laundry and ice and vending machines. The complimentary breakfast is the only meal served here. Lunch and dinner are available at Hunter's Steakhouse located on the hotel grounds. This Comfort Inn and Suites is ideal for families with younger children. Thats the view of several guests who have stayed at this hotel and say the employees here are very child-friendly and know the best times to visit the attractions. Those who paid a little more for a two-room suite say the accommodation was squeaky clean, spacious and well equipped. Many clients said the complimentary breakfast made a great start to a Californian morning and they plan to return to this hotel on future visits to San Diego. Parking: Yes, there is parking. It costs $4.95 per day.